The founding words of the Finnish Arctic Club were uttered in May 1982, in the stark landscape of the Greenland East Coast. Two Finnish trekkers with a fondness for artic regions were pushing on, regardless of all hardships. Two weeks of slogging had already passed, when unexpected burning stomach pains made travelling so much more difficult. There were still another 300 km to go, and a possible shortcut did not look enticing when the situation was contemplated over the 1:2 500 000 scale map acquired for the journey. Over the next painful weeks, the trekkers had time to consider how at least future expeditions could be better prepared. Would there have been other Finnish trekkers whose knowledge and expertise, combined with their own, could have helped to bring the current expedition to a successful end? The slow going stretched the timetable to the extent that towards the end of May, the men ran completely out of food. A local dog team driver had been contracted to pick the trekkers up at the head of a fiord, but when they arrived there, the place was deserted. That was when they understood the meaning of the word "immaqha". This is the Eskimo word for "maybe", and was the answer given to the trekker's request to be picked up at the journey's end. After a few days of starving, the local police constable - who also knew about the Finns' travel plans - arrived to check up on the situation and helped the men finish the remaining 150 km to the village and civilization. The organizing of the Finnish Arctic Club was initiated by these two men, Eino Putkonen and Matti Taponen, in the autumn of 1982. The founding meeting was held on July 30-31, 1983, in Tampere, at the Rosso Restaurant adjoining the local public swimming pool. The assembly consisted of 16 Finnish arctic trekkers representing eight different expeditions. Those present included Christer and Peter Boucht, Viljo Haapala, Eero Varonen, Pentti Kronqvist and representatives of Expedition 76, the Spitzbergen expedition of the Suomen Latu organization, as well as expedition groups from Hämeenlinna, Vantaa, Kerava, and Espoo. The members had attained many notable triumphs since Erik Pihkala and his friends first crossed the Greenland icecap in 1966. Since then, Finnish arctic trekkers had, e.g., visited the North Magnetic Pole and crossed difficult mountain glaciers in Spitzbergen and Greenland. Engineer Eino Putkonen from Kuopio was elected the first chairman of the club. The goal of the club was to disseminate information on natural conditions, logistics, and necessary permits to trekkers heading for the arctic regions. In the days when even overseas correspondence was carried out by mail or over the telephone, direct contacts with local authorities in the target area and with outfitters were essential. The club members were prepared to share all of this information. In order to carry out its mission, the club would seek to bring together people interested in arctic expeditions and arctic regions, and to collect the valuable knowledge that they had acquired. The club members considered one of the most important functions to be the forming of an information network and the possibility of a personal dialog with the source of information. During the 1980s, the club met yearly. Attempts were made to promote the club among young trekkers. Articles were run in, e.g., a wilderness sports magazine and in the leading daily, Helsingin Sanomat. A new sleeve patch and logo were adopted. The logo was designed by Juankoski artist Pertti Sallinen and represented a polar bear on an ice floe, surrounded by the aurora borealis. The logo was adopted for the purpose of promoting the club and its use was limited to club members "for honourable purposes." On November 8, 1986 Kalevi Kilpi was elected to the chair. The same meeting featured a talk by zoologist, professor Erkki Pulliainen, who charged 300 Finnmarks for his lecture. On October 28, 1989 Christer Boucht was elected to the chair. 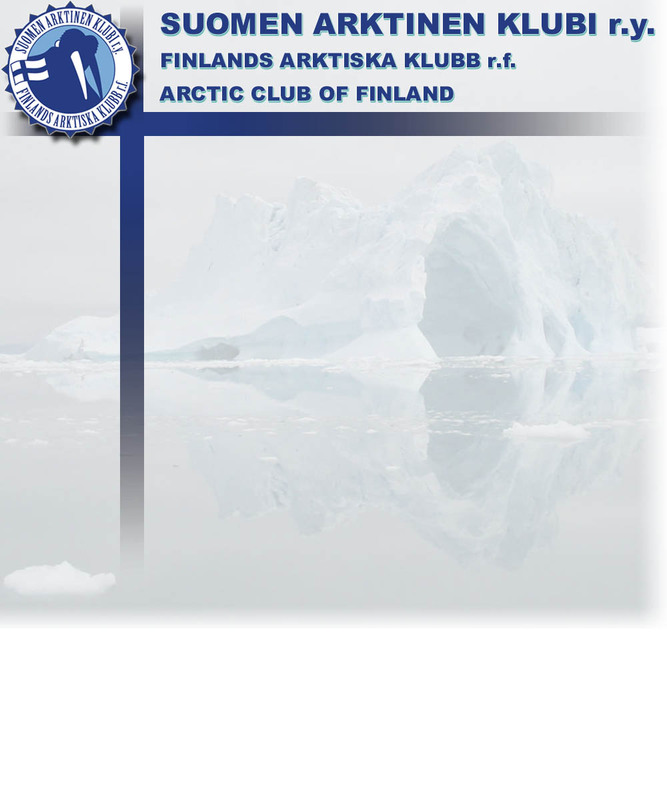 The meeting also voted to officially register the Finnish Arctic Club - Suomen Arktinen Klubi - Finlands Arktiska Klubb. Eero Varonen was elected the first vice-chair of the "official" club, and the seats of the three board members stipulated in the rules set forth by the meeting were filled by Stig Björk, Kalevi Kilpi, and Eino Putkonen. The charter stipulated, e.g., that if the club were to be terminated, its funds should go to benefit the Nanoq Arctic Museum in Jakobstad. On October 20, 1990 Kalevi Kilpi was again elected chairman. During the early 1990s, a new Finnish Arctic Club logo with the name text surrounding a map of the polar regions north of the Arctic Circle was in general use. On November 25, 1995 Stig Björk was elected chairman. On his proposal, the club's logo was renewed once again. The polar bear was exchanged for a frontally portrayed walrus. The logo was also used in miniature flags that were presented to club chairmen and other persons or institutions that had acted to promote knowledge of the Arctic regions. The most important recipients of miniature flags were the Arctic Societies of other Scandinavian countries and their counterpart in Russia. The meeting, held at the Nanoq Museum, also decided to change the membership requirement to a demanding expedition-type trek of a minimum of two weeks' duration. The previous requirement had been three weeks. Although the decision to officially register the club had been made in 1989, the necessary official seal to the documents was not acquired until December 29, 1995. The club was now an official registered society based in Vaasa. On October 12, 1996 the club´s annual meeting on the Arctic Circle hosted the secretary of the Swedish Polar Club, Fred Goldberg, who gave a presentation with the title "The history of polar exploration as seen through the lens of a camera." In the same meeting Viljo Haapala from Hailuoto talked about sealing on the ice in the Gulf of Bothnia in the old days, Pentti Kronqvist described the birth of the Nanoq museum, and Matti Tervaskanto and Reima Mustonen presented a fine series of slides from the Huurre Expedition to the North Pole in 1984. The evening ended with Matti Taponen's presentation of the transportation and setting up of the Finnish ABOA research station in Antarctica. Towards the end of the 1990s expeditions and research in the arctic regions were on the increase. The regular activities of the Airborne Ranger Club of Finland in the arctic regions also brought the club many new members. The annual meeting held in Tampere on October 24, 1997 featured a talk by Odd Lönö, secretary of the Norsk Polarklub, on the subject of polar bear hunting on Spitzbergen in the old days. Pentti Kronqvist translated the talk into Finnish. In the same meeting chairman Stig Björk presented the miniature flag of the Arctic Club to Christer Boucht, Viljo Haapala, and Eero Varonen, and to the Nanoq association and the Norsk Polarklub. Finally, the newest club member, Petter Reuter, gave a talk on his attempt to reach the North Pole from the northern point of Greenland. 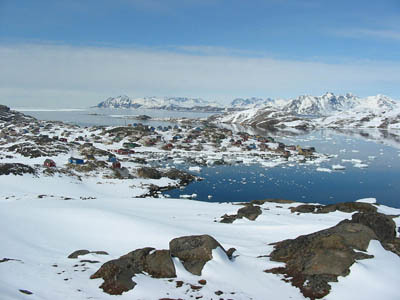 The Club's board of directors arranged a Winter Activity Day on the sea ice outside Jakobshavn in the spring of 1998, but attendance was low. The annual meeting on October 24, 1998 was attended by by an important guest: Tommy Pedersen from Denmark, who gave a talk on what it was like to drive a dog sledge in the Sirius Patrol in Greenland. Pedersen's 26 month stint in Greenland, during which he logged 8000 kilometres by dog sledge, gave him a lot to talk about. Tommy Pedersen was presented with the Club's miniature flag. In the same meeting, the Club's new expedition flag, emblazoned with the walrus logo, came on sale. In July 1998 Pentti Kronqvist presented the Club's miniature flag to the Umberto Nobile museum in Italy. The 1999 annual meeting in Hämeenlinna on November 20th was televised, thanks to the members of the Airborne Ranger Club's Greenland expedition being accepted as members. The meeting featured talks by Martti Vainio on a mountain climbing trip to East Greenland, eskimologist Eva Jansson on the everyday life of Eskimos in northwest Greenland, Veikka Gustafsson on mountain climbing on Antarctica, and Kari Vainio on the Airborne Ranger Club's crossing of Greenland. The Club's miniature flag was presented to former chairmen Kalevi Kilpi and Eino Putkonen. The first meeting of the new millennium on October 28, 2000 featured several historical talks. Veijo Meriläinen talked about his trip to the South Pole the previous winter (summer over there), professor Matti Seppälä talked about research on the glaciers of Antarctica and Alaska. Director Victor Bojarski and marketing director Victor Sverov of the Arctic and Antarctic Museum in St. Petersburg talked about Russian activities on the North Polar ice. Finally eskimologist Eva Jansson introduced a book on Eskimo culture that she had translated. The presentations took place at the Jakobstads Gymnasium school in Jakobstad, while the actual annual meeting was held later in the evening at the Nanoq Museum. The agenda included the requirements for membership. The meeting decided that persons who had taken part in a journey of at least two weeks'duration in a region beyond the treeline and in the area of continuous permafrost were eligible for membership. Thus the original requisite of a three weeks' demanding trek remained overturned. The Club's miniature flag was presented to the Arctic and Antarctic Museum of St. Petersburg. The annual meeting of November 17, 2001 decided to set the yearly membership dues at 20 €. New members included Riikka Jaakkola, Anna Parkkari, and Mikko Suominen, who paddled from Longyearbyen to Ny Ålesund in Spitzbergen. The presentation part of the meeting took place at the Vapriikki Museum Centre in Tampere. Cinema director Markku Lehmuskallio talked about his collection of native art that was on exhibit at the museum, Dr. Jarmo Kankaanpää gave a talk under the title "Bering Strait - the connection that never broke" in connection with the Arctic Civilizations exhibition, and Dominick Arduin talked about her skiing trip to the North Magnetic Pole. After the talks, the members moved to the Seitseminen Nature Centre in Kuru, where the annual meeting took place. After the meeting, associate professor Tuija Rankama gave a talk under the title "The call of the Kobuk - the life of the northwest Alaskan Eskimo then and now" and Eva Jansson gave a guided tour of the Eskimo exhibit she had assembled at Seitseminen. The 2002 annual meeting was held at the Vapriikki Museum Centre in Tampere. Accepted new members were Timo Polari, Patrick Degerman, Petri Heinonen, and Hannu Salo. Pentti Kronqvist moved that Christer Boucht and Eero Varonen be named honerary members and this was approved by the meeting. Jarmo Kankaanpää was elected chairman. Retiring chairman Stig Björk was presented with the Club's miniature flag. Presentations included talks by Timo Polari on the subject "Goal: the South Pole", Mikko Suominen and Riikka Jaakkola on "Spitzbergen - a canoe expedition to an arctic wilderness", Mika Kalakoski on "Life at the Finnish Antarctic research station", and Heikki Karinen on "Medical care on an arctic expedition". The 2003 annual meeting was again held at the Vapriikki Museum Centre in Tampere. Accepted new members were Malin Moisio, Rinna Härkönen, Matleena Piesala and Johanna Tyynelä on the basis of a foot trek in Spitzbergen and Perttu Ojala, Tero Teelahti and Jermi Tertsunen on the basis of a ski trek to the North Magnetic Pole. Talks included a presentation by Kari Vainio and Kari "Poppis" Suomela on the Airborne Rangers Club's expedition to the North Magnetic Pole in 2003, a talk by Jarmo Kankaanpää on the arctic technologyof the Eskimo, and a presentation by the "Aina Nälkä" ("Always Hungry") scout patrol (Moisio, Härkönen, Piesala and Tyynelä) on their trek on Spitzbergen and the preparation of trek provisions. The 2004 annual meeting was held at the Tampere Central Library. Accepted members were Petri Mäkelä and Petri Vuorenmaa. After the meeting Petri Mäkeä gave a talk on their ski trek across Greenland and Pekka Havola lectured on his uncle Antero Havola, who joined the U.S. Army after the war and led the first column overland from Byrd Station to the North Pole in 1961. The 2005 annual meeting was held on 19 November, again at the Nanoq Museum in Jakobstad. No new members were accepted. The most important decision of the meeting was probably the establishing of the Club's own internet pages, which were registered in the spring of 2006 after a vote under the name "arktinenklubi.fi". Petri Mäkelä and Petri Vuorenmaa were appointed as directors of the web page project. After the meeting, Petri Mäkelä talked about a month-long trek Svalbard-2005 expedition and Kari Vainio presented his lecture on "How to deal with a polar bear encounter", which was approved by the membership. The most eagerly awaited presentation was given by Toni Vaartimo, who talked about the Airborne Ranger Club's North Pole Project, planned for the spring of 2006. In the 21st century, arctic trekking had become so popular in Finland that in the spring of 2006, for instance, more than 30 people were able to fulfill their dreams of an arctic journey. Expeditions were mounted to the North Pole, across Greenland, and across Spitzbergen. The 2006 annual meeting on November 18th included an uncommonly long list of new members: Eero Oura and Vesa Luomala had crossed Greenland and Jussi Hilden, Jari Kaaja, Harri Kalliovalkama and Sami Nytorp had trekked on Spitzbergen, as had also Marko Kaleva, Jani Kokko, Kari Kossila, Janne Kukkonen, Hannu Löppönen, Matti Mikkola, Petri Nevalainen, Hannu Ojanen, Maria Savolainen, Timo Stenros, Arto Suhonen and Raimo Västinsalo, whose expedition was led by Kari "Vaiska" Vainio. In addition to the new members, the meeting's agenda also included the approval of the Club's new logo, which was accepted after a short discussion. The new logo was designed by Jarkko Salama and can be viewed on the top of this page. Other topics included the Club's new internet pages and a discussion on the possibility of publishing a book on the Club's history. Jarmo Kankaanpää stepped down from the post of chairman and Henrik B. Reims was voted unanimously as the new chairman. 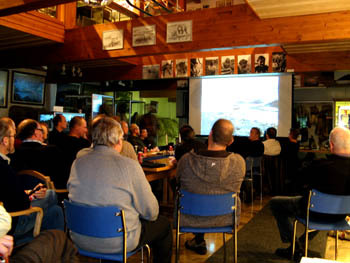 The lecture programme included talks by Eero Oura on the crossing of Greenland, Jari Kaaja on the Svalbard-2006 expedition, and finally Henrik Reims on the North Pole-2006 expedition. The 2007 annual meeting was held in the Goichman Gallery of the Nanoq Arctic Museum on November 17th. The following candidates were accepted as members: Jarkko Kiviniemi, Anu Korvenniemi, Kimmo Leppänen, Teija Parkkinen, Paula Pohtio, and Marko Savola on the strength of a three week journey on Spitzbergen and Sauli Herva based on a dog sled expedition to the northern parts of Spitzbergen. Henrik B. Reims retained his seat as Chairman, the remainder of the Board consisting of Kari Vainio, Pete Mäkelä, and Kalevi Kilpi. The Board was authorized to set in motion the preparation of a history of the Club. Pentti Kronqvist, the director of the Nanoq Arctic Museum and veteran of several arctic trips, was nominated Honorary Member and freed from paying membership dues. The programme of the evening included a scientific section as Veli-Pekka Salonen gave a talk on the Nordaustlandet Expedition (the Kinnvika Project). Over the course of an interesting hour we heard how glaciologists from the University of Helsinki studied traces of climate change in the Arctic regions. Other presentations included Kari Vainio’s talk on the Spitzbergen 2007 Expedition, the Vuorenmaa-Mäkelä duo’s presentation on their upcoming ski trip across Greenland lengthwise, and Sauli Herva’s talk on his dog sled expedition on Spitzbergen. The Chairman inaugurated a new tradition by presenting a short overview of future expeditions planned for 2008 and of recent publications on cold regions. The evening continued with the traditional smoke sauna and finally ended in the new command bunker.